We're being teased with an 80* day tomorrow but by the kick over the top of the waves in Santa Monica Bay this morning, I'm calling the weather forecaster's bluff. I'm desperate for 70º days and stayed up until the wee hours last night with my girlfriend who's visiting from college, to make and photograph cocktails using every seasonal fruit in the house. This is the one we sipped while I "worked." 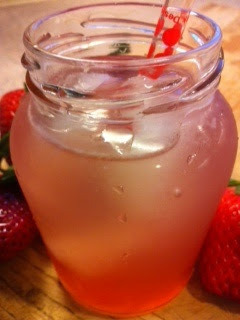 Directions: muddle strawberries with the vodka & strain into a shaker with the triple sec and vanilla. Mix well & pour over ice.